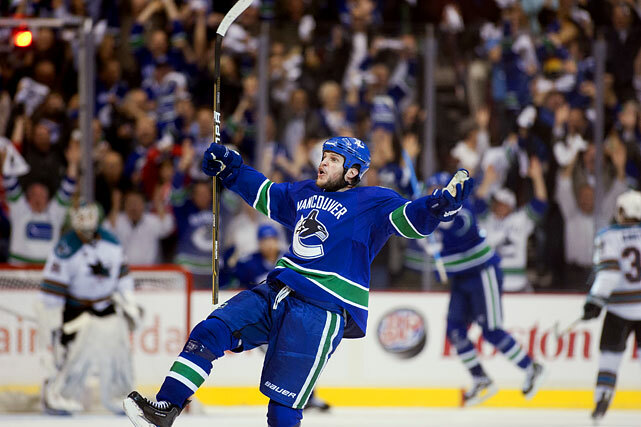 Can the Canucks get back to the Cup and redeem themselves after heartbreak? After falling one game short against the Boston Bruins, the Canucks endured a long summer of soul searching. Vancouver never trailed a series until they lost game 7 of the Stanley Cup Final. Their regular season was dominant, but they still lost. So where do you go from there? Well, the Canucks lost Christian Ehrhoff, Raffi Torres and Tanner Glass, but are hoping Marco Sturm, Owen Nolan, and others can fill in admirably. Admittedly, the Canucks suffered a glut of injuries last year, especially to their defense, and especially in the playoffs when it mattered most. A return to health for their blue line and checking lines would provide some relief to others. All in all, the Canucks are in a weak division and should repeat as Division champions, and likely run deep into the playoffs once more. While Kesler and Bieksa provided playoff performances to remember, Luongo and the Sedins were met with mixed reviews due to inconsistency. Luongo especially may have a short leash. Do the Canucks have the mental strength to get past Chicago, Los Angeles, Detroit and San Jose once more to get back to the Cup Final? Forwards The Canucks have some new veteran forwards this year. Will any make an impact? 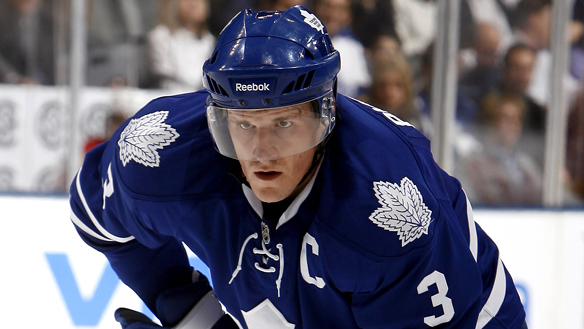 Henrik Sedin The Canucks captain is one of the most durable and consistent scorers in the league. Barring injury, Henrik should once again approach the 100 point level, with about 80 assists. Henrik makes those around him better, and he’s a fantasy stud for plus/minus as well. Daniel Sedin Daniel, much like his brother Henrik is also extraordinaly consistent. He’s the goal scorer of the duo and may come close to 40 goals this year. Rumour has it the twins entered training camp in better shape than ever before, and they have something to prove. 35 goals and 90 points are within reach yet again. Ryan Kesler The Selke Trophy winner surprised many by breaking out for 40 goals last night. This year, he’ll have to wait his turn, recovering from an injury. When he’s on the ice he’s one of the more dominant players in the league. Assuming he misses some time and has a slow start, 60 points and 30 goals is reasonable. Alex Burrows Burrows has evolved into the Sedin twins perfect linemate. Tenacious on the forecheck, good along the boards and strong in front of the net, Burrows has some hands and knows where to be. 25 goals and 55 points for this pesky winger. 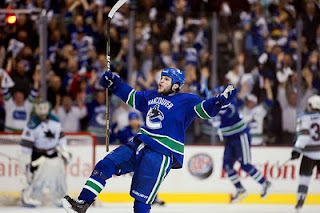 Chris Higgins Higgins was a late season pick up for the Canucks, who played quite well in the playoffs. Higgins will be used on the second and third lines primarily, and should be good for 40 points, mostly as a complimentary winger. Mikael Samuelsson Samuelsson may replace Ehrhoff on the power play and generate more offense this year. If he can stay healthy, 55-60 points are within reach. He’ll likely be on the second line alongside Kesler once the line up settles a few games into the year. He may also see some time with the twins. Mason Raymond Raymond suffered a horrendous injury in Game 6 of the Stanley Cup Finals and will take some time returning from it. Assuming he returns in November and plays about 60 games, he should tally about 15-20 goals and 40 points. Perhaps stay away this season unless he returns to prominence quickly. Marco Sturm The speedy German winger has a spot penciled in on the Canucks second line until Raymond and Kesler both return. Expect Sturm to make the most of the opportunity and split time on the 2nd and 3rd line. 40 points are quite possible. Bieksa showcased himself as a leader of the Canucks in the playoffs, earning a new contract this summer. Bieksa can reach the 40 point plateau with increased responsibility. He also can lead in PIM and plus/minus. Alexander Edler Some feel that Edler benefited from Christian Ehrhoff, but anyone who watches the Canucks regularly knows that Edler may be their best all-around defender. His cannon of a shot could see him net 10 goals and 50 points. Roberto Luongo There are fewer more polarizing figures than Luongo. One of the NHL’s best goalies, he can be brilliant one night and horrendous the next it seems. Within a week he was a Conn Smythe option or the goat for the Canucks’ loss. Still, he’s solid and on a very good team. Cory Schneider Quickly becoming consensus, Schneider is arguably the best back-up goaltender in the NHL. His 16 wins last year are a testament to his ability. He’ll get his chance soon, and probably more action this year as well. Alex Burrows Everyone by now has heard of Burrows’ tremendous chemistry with the Sedin twins, but few have considered that he still spends plenty of time alongside Ryan Kesler, alternating with Mikael Samuelsson, Jannik Hansen or whomever else winds up there. If Burrows were to spend an entire season alongside the twins, relatively uninterrupted, he could net 30 goals and 60 points. While Burrows has already hit his potential in some regards, his advantageous position could push him even higher. C Cody Hodgson The one youngster who may make the line up is Cody Hodgson. Hodgson, depending on who you ask, is on the verge of breaking out, or the verge of being a bust. Last year in limited action he showed potential. He scored a nice goal in fourth line duty. With Kesler and Raymond injured for the beginning of the year, there’s a window of opportunity for Hodgson to assume a top-6 role. The big Swede is out from under the shadow of Mattias Ohlund. 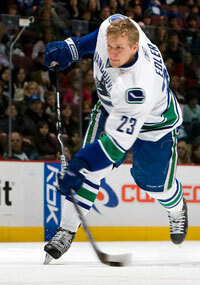 Edler can hit, shoot and pass with the best of them. At 6’3” and 215, he’s a powerful blue liner who has flown a bit under the radar across the league. At only 25 years old, his prime years are approaching. The loss of Christian Ehrhoff should elevate Edler’s role with the team and give him more power play time. Expect a career year, perhaps surpassing 50 points. Edler will also generate solid plus/minus numbers and should see plenty of time as a 5– man unit with the Sedin twins and Alex Burrows. I agree on the toughness for sure... I'd like the Canucks to make a good offer for Shane Doan. Think he'd be perfect on Kesler's wing, and he's a UFA at year's end!